Age and the fact it’s bilateral make it unlikely to be tibiofemoral and more likely to be PFJ. Runs >1mile and worsens to 3 miles where she stops as worried about the pain. It then lasts for a few hours but not into the next day. Kneeling at baby’s bath time and crouching to play with baby immediately painful. Stair descent painful, ascent fine. Clutch on new car painful. This is more mechanical than inflammatory as the pain is identifiably aggravated by certain activities and does not last into the next day. ‘Runners knee’ nickname for PFP as it is a stressor to the PFJ’s. Kneeling and crouching also stressors to the PFJ through direct pressure with kneeling, and compression through quads being end of range for kneeling and crouching. Stair descent pain classical for PFJ problems. Clutch in new car-how much driving is she doing, and can we alter ergonomic set up? Immediate with extension both NWB and WB. Again, sounding very much like PFJ. Unlikely to be eased by extension if it was infrapatellar fat pad. Regularly exercised x4 a week, including x2 10km runs until pregnancy. Tricky pregnancy with lots of sickness, followed by C section means she has not exercised for last 18 months. Stopped gym membership, ‘waste of money’, and trying to run x1 a week at weekend when she is ‘going for it’ as it’s her only real exercise. Misses the social interactions of exercise classes she used to do at the gym. She was an events manager, ‘always on her feet’. She has stopped work as the hours are too long. She is doing more day-to day driving trying to get out and about with new baby. Insidious onset of pain 2 months after re-starting running. This lady has had a massive change in her exercise profile and will have therefore lost a lot of strength and conditioning. She has had a huge change in her social interactions due to loss of work and classes. Can this be improved? She is frustrated and low in mood which means she is pushing herself hard on her run and may also be altering her pain processing. One run a week is insufficient to build decent running condition. The car ergonomics need to be looked at as this is an identifiable aggravating factor, and something she is doing several times a day. Post-natal depression. Now ‘ok’, but still finding it ‘tough’. Sleep still very disturbed, (x1-2 a night every night). Not always the baby but she feels she has ‘lost the habit of sleeping’. Exercise may well be an important part of the Mx of this lady’s mental wellbeing and therefore we need to aim for more than x1 week. Sleep deprivation alters down-regulation of pain and also ability to cope and mood. Exercise may help with normalisation of sleep pattern. No indication for imaging. Non-traumatic, bilateral, no effusions. Education around the fact it is a pressure pain caused by loss of conditioning to cope with running load. No need to be worried. 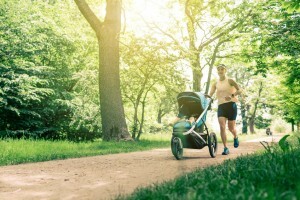 Recommend looking for a buggy-fit class to help exercise with baby and social isolation. Look at car ergonomics. Can steering wheel come out more to enable seat to go back further so knees less flexed? Discuss what she feels she could realistically manage at home with respect to exercises. Suggest three exercises, alternate days to light fatigue to address global strength and motor control. No downhill running at the moment. Ultimately help her recondition and safely build up her running volume.